Sirena Beach is a location found on Isle Delfino in Super Mario Sunshine. It is located on the island's south coast, right behind Pinna Park. Its name probably derives from "Sirena", the Italian and Spanish term for "mermaid". It also bears similarity to the term "serene", describing the atmosphere of the beach. Sirena Beach is famous for being the home of Hotel Delfino, a well-known four-star hotel and seaside resort. 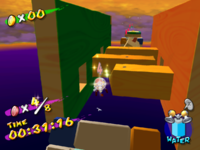 The level itself can only be accessed through a red Warp Pipe in Delfino Plaza, on top of the building behind the Grand Pianta Statue. 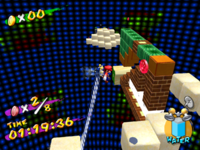 The pipe is initially blocked by a giant pineapple and eating it with Yoshi will open up the level, meaning this level can only be accessed after the player has cleared Episode 4 of Pinna Park. Mario only visits Sirena Beach in the evenings (the only time it can be seen during the day is when it is viewed from Pinna Park). Mario and Peach at Sirena Beach in the ending of Super Mario Sunshine. Sirena Beach has three main areas: the exterior and the interior of Hotel Delfino, and the hotel's casino. The exterior of the hotel is a large beach with pools of water, torches, cabanas, and terraces nearby. The layout of the beach is, if examined closely, identical to the layout of a GameCube controller, if seen from the hotel looking out to the sea. The pools of water represent the , , , and buttons, a small flame to represent the , the chairs set up beyond that to represent where "Nintendo GameCube" would be printed, and two cabana huts to represent the and . During Episode 1 and Episode 6, the beach is covered in electric Graffiti and the hotel itself will be inaccessible during those episodes. The interior of the hotel consists of three floors and a maze-like attic. Mario can enter the hotel by talking to the Hotel Manager at the front doors. 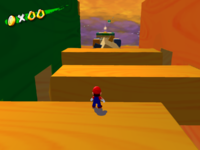 Once Mario enters the level, he is not able to leave unless the player returns to Delfino Plaza through the pause menu or completes the current episode. Mario can move through the different rooms in the hotel, though some of the doors are locked from the outside. There are many secret passages in the hotel that either lead from one room to another or to a different floor. During certain missions, Boos will be in most of the rooms. The hotel's casino is accessed by talking to the bellhop to the left of the first floor. 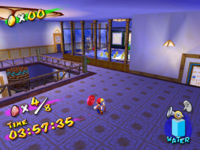 Like with the main hotel, Mario cannot leave the casino unless the player returns to Delfino Plaza or completes the current episode. The player can only access the casino during Episodes 4 and 5. The casino is made up of large slot machines, two of which Mario can turn by using F.L.U.D.D. to either spray each individual slot on the slanted one or the machine as a whole on the rounded one. A large roulette wheel is placed in the center of the room. The Manta Storm This episode's objective is to defeat Phantamanta. The Hotel Lobby's Secret This episode's objective is to enter the golden Boo statue on the third floor of the hotel. Mysterious Hotel Delfino This episode's objective is to navigate Hotel Delfino. The Secret of Casino Delfino This episode's objective is to find and complete a secret course in the hotel's casino. King Boo Down Below This episode's objective is to defeat King Boo. Scrubbing Sirena Beach This episode's objective is to clean Sirena Beach within a time limit. 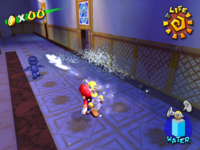 Shadow Mario Checks In This episode's objective is to defeat Shadow Mario as he runs around Hotel Delfino's interior. Red Coins in the Hotel This episode's objective is to collect the Red Coins in the hotel. Red Coins in Boo's Big Mouth This episode's objective is to collect the Red Coins in the Hotel Lobby's Secret. Red Coin Winnings in the Casino This episode's objective is to collect the Red Coins in the Casino Delfino's Secret. 1 Episodes 2-8 Obtained by spraying the second torch in front of the hotel. 2 Episodes 2-8 On top of a platform behind the hotel. 3 Episodes 2-8 Obtained by spraying the flower bed behind the hotel. 4 Episodes 7 and 8 Obtained by spraying Graffiti on a wall in front of a staircase by the hotel. 5 Episodes 2, 6, 7 and 8 Obtained by spraying a small signpost between the two pools. 6 All Off the shore of the beach, behind a wall. 7 Episodes 1 and 6 Reward for saving a Noki from Electric Goop. 8 Episodes 1 and 6 Reward for saving a Noki from Electric Goop. 9 Episode 6 Reward for saving a Noki from Electric Goop. 10 Episode 6 Reward for saving a Noki from Electric Goop. 11 Episodes 2-8 Underneath one of the huts in front of the hotel. 12 Episode 5 Obtained by spraying Graffiti located above the casino door (from the inside). 13 Episodes 4 and 5 Obtained by spraying one of the two torches located above the pools in the casino. 14 Episodes 4 and 5 Obtained by performing a Ground Pound on the second slot machine in one of the sets in the casino. 15 Episodes 7 and 8 Obtained by spraying Graffiti on the third floor. 16 Episodes 7 and 8 Obtained by spraying corresponding × Graffiti on the third and second floors. 17 Episodes 7 and 8 Same as Coin 16. 18 Episodes 7 and 8 Obtained by spraying corresponding △ Graffiti on the first and second floors. 20 Episodes 4, 5, 7, and 8 Inside a crate in a room in the corner of the second floor. 21 Episodes 3, 4, 5, 7, and 8 In the second room on the second floor. 22 Episodes 3, 4, 5, 7, and 8 In the first room on the second floor. 23 Episodes 3, 4, 5, 7, and 8 Obtained by spraying a board in the first room of the third floor. 24 Episodes 3, 4, 5, 7, and 8 In the second room of the third floor. 25 Episodes 3, 4, 5, 7, and 8 At a dead end of the attic maze. 26 Episodes 7 and 8 Obtained by spraying Graffiti in a large room in the attic maze. 27 Episodes 4, 5, 7 and 8 Obtained by defeating the single Boo located in the attic maze. 28 Episodes 3, 4, 5, 7, and 8 Obtained by spraying the ceiling light on the third floor of the hotel. 29 Episodes 3, 4, 5, 7, and 8 Obtained by spraying a bookcase in the third room of the third floor. 30 Episodes 2, 3, 4, 5, 7, and 8 Obtained by spraying a lamp on the third floor. The music of Sirena Beach is mostly inspired by Hawaiian music (albeit adjusted to be slightly unsettling). While an upright bass provides a bassline, a steel guitar slides repetitively. Synthesizer and maracas play constantly in the background, while electronic organ and acoustic guitar also contribute to the melody. The theme was composed by Shinobu Tanaka. 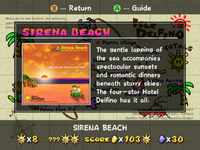 Isle Delfino Guide Book information for Sirena Beach. The gentle lapping of the sea accompanies spectacular sunsets and romantic dinners beneath starry skies. The four-star Hotel Delfino has it all. 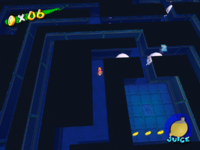 In Super Smash Bros. Brawl, the Warp Pipe leading to Sirena Beach is absent in the Delfino Plaza stage. The music in the hotel's casino was used in Super Mario 64 DS and New Super Mario Bros. in Luigi's minigames, but did not have the saxophones or whistling. This page was last edited on November 6, 2018, at 16:09.